Whether you are wanting to host your Ceremony, Reception or both, the Veranda is the perfect setting for your special day! We have several private dining areas that can be combined to offer sit-down dinner receptions or rehearsal dinners, a garden courtyard cocktail reception or if your event necessitates complete privacy, the entire restaurant can be yours. The following menus have been designed to make your experience at the Veranda an unforgettable one. If you wish, allow us to create a personalized menu specifically for your professional or personal needs and tastes. 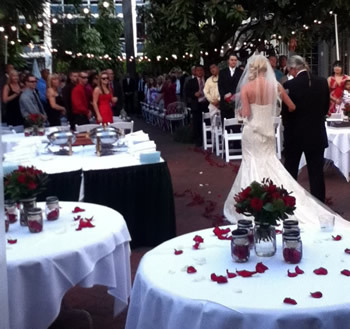 The Veranda will make planning and executing your Wedding effortless and fun. We will make you feel at ease with the details, so that you may enjoy your special day with your guests. Contact Micki Carlson-Funk to request a Private Party by filling out this form.